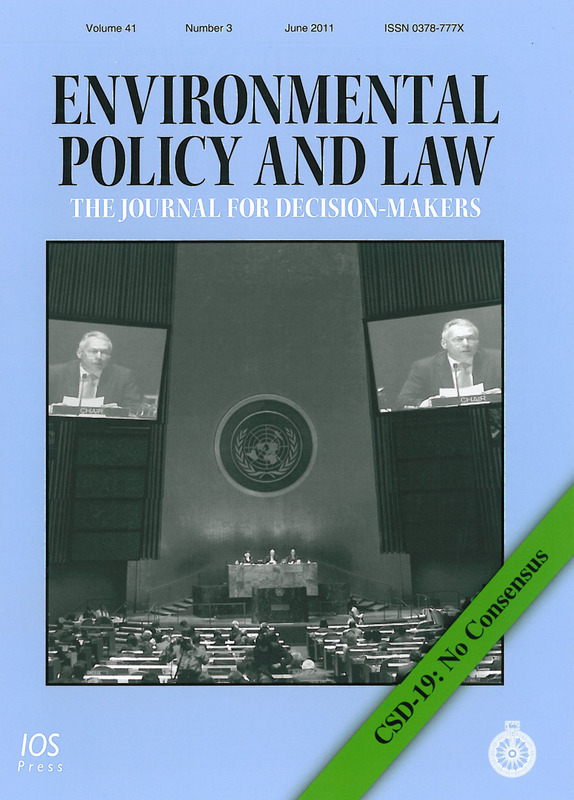 It is with deep sadness that we announce the passing of Dr. Wolfgang E. Burhenne, the Editor-in-Chief of Environmental Policy and Law. For more information, please visit the following website. This international journal is created to encourage the exchange of information and experience on all legal, administrative and policy matters relevant to the human and natural environment in its widest sense: air, water and soil pollution as well as waste management; the conservation of flora and fauna; protected areas and land-use control; development and conservation of the world's non-renewable resources. In short, its coverage includes all aspects included in the concept of sustainable development. For more than three decades Environmental Policy and Law has assumed the role of the leading international forum for policy and legal matters relevant to this field. Environmental Policy and Law is divided into sections for easy accessibility. These sections cover the activities of the United Nations and its specialized agencies, other international developments, regional activities within the framework of European Union, AU, ASEAN, etc., and developments at the national level from all over the world. An important and distinctive feature is the publication of selected documents appearing with the minimum of delay, which are not easily accessible, such as the resolutions from non-public meetings of parliamentarians, guidelines or draft conventions not yet published or newly concluded agreements. Environmental Policy and Law fills a gap left by other publications. Subscribers are politicians, government officials at the highest level of decision-making, academics, scientists, practising lawyers, firms, and private persons wishing to keep up to date on contemporary policies and practices. After the article has been accepted, the authors should submit the final version as source files, including a word processor file of the text, such as Word. Manuscripts should be prepared with standard margins, submitted in “Times New Roman” font size 12, single spaced throughout. Every page of the manuscript, should be numbered. However, in the text no reference should be made to page numbers; if necessary, one may refer to sections by title only (not by number). Try to avoid the excessive use of italics and bold face. Citations shall be noted as endnotes, numbered as 1, 2, 3, etc. Lengthy endnotes should only be used if absolutely essential. In most cases it is possible to incorporate the information in the text. Lists of References will substitute for endnotes, but should not be additional. References that are not mentioned in text will be deleted. Separate Bibliographies should not be submitted. Endnotes should be numbered in the text, indicated by superscript numbers and kept as short as possible. Authors are encouraged to submit figures, tables, photographs and other illustrations for inclusion in the publication, and are responsible for any necessary permissions relative to use of these materials (see below). EPL may, in some cases, include relevant illustrations and figures, selected with attention to the content of the article. The corresponding author of a contribution to the journal will receive one hard copy of the journal as well as a complimentary PDF Author’s Copy of the issue unless otherwise stated. This PDF copy is watermarked and for personal use only.